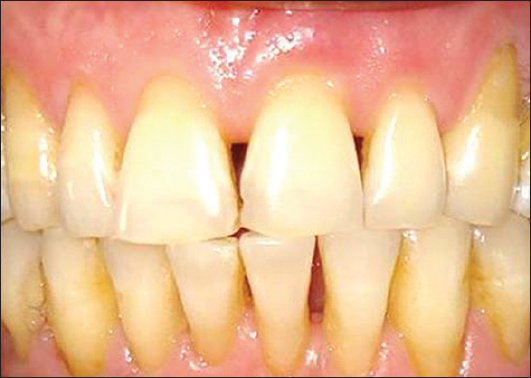 Aggressive periodontitis (AgP), occurs in a younger age group (≤35 years) and is associated with the rapid destruction of periodontal attachment and supporting bone. Genetic polymorphisms are allelic variants that occur in at least 1% of the population that could potentially alter the function of the proteins that they encode. Interleukins are a group of cytokines that have complex immunological functions including proliferation, migration, growth and differentiation of cells and play a key role in the immunopathogenesis of periodontal disease. The aim of this review was to summarize the findings of studies that reported associations or potential associations of polymorphisms in the interleukin family of cytokines, specifically with AgP. Epigenome refers to "epi" meaning outside the "genome." Epigenetics is the field of study of the epigenome. Epigenetic modifications include changes in the promoter CpG Islands, modifications of histone protein structure, posttranslational repression by micro-RNA which contributes to the alteration of gene expression. Epigenetics provides an understanding of the role of gene-environment interactions on disease phenotype especially in complex multifactorial diseases. Periodontitis is a chronic inflammatory disorder that affects the supporting structures of the tooth. The role of the genome (in terms of genetic polymorphisms) in periodontitis pathogenesis has been examined in numerous studies, and chronic periodontitis has been established as a polygenic disorder. The potential role of epigenetic modifications in the various facets of pathogenesis of periodontitis is discussed in this paper based on the available literature. Context: Periodontal disease and oxidative stress (OS) are part of a vicious cycle with each causing a deleterious effect on the other causing changes in the levels of antioxidants, and enzymes of antioxidant defense. Biomarkers and methods used for measuring OS are very expensive. Aims: To see how gamma-glutamyltransferase (GGT) fares, as a biomarker for OS in periodontits along with other routinely used biomarkers. Design: A cross-sectional study involving 300 people of which 150 were cases and 150 were controls. Setting: Candidates enrolled were patients visiting the OPD of MGV's Dental College and Hospital, Nasik, India between January 2011 and December 2012. Materials and Methods: Serum samples of patients with periodontitis, and controls were analyzed for malondialdehyde, superoxide dismutase (SOD), glutathione peroxidase (GPx), uric acid, and GGT. Statistical Analysis Used: Analysis was performed using Student's t test. P <0.05 were considered to be significant. Results: Malondialdehyde values were found to be significantly higher cases, while SOD, GPx and uric acid levels were found to be lower than controls. GGT levels were significantly higher in cases as compared to controls. Conclusions: GGT may be used as a cheap, quick, easy and precise marker for measuring OS. Context: Despite the recognition that systemic factors can alter the risk to the chronic periodontitis (CP), only recently has evidence begun to emerge, still under investigation, that infections of the oral cavity are related with low quality-of-life (QoL) and are able to influence the occurrence and severity of certain conditions and systemic diseases. Aims: The aim of this study was to evaluate the impact of CP on the QoL and on the metabolic systemic condition of CP patients. Settings and Designs: Cross-sectional, case-controlled, age- and gender-matched study. Subjects and Methods: Quality-of-life assessment (Functional Assessment of Chronic Illness Therapy-Fatigue), periodontal examinations and blood tests were obtained from 20 CP patients and 20 age- and gender-matched healthy controls (HC). Statistical Analysis Used: parametric paired t-test for numerical data (metabolic parameters) and nonparametric paired Wilcoxon signed rank test to compare the QoL ordinal data of both groups. Statistical significance was determined at the 0.05 level. Results: Healthy controls had fewer negative impacts in all QoL areas studied. CP patients showed higher levels of low-density lipoprotein cholesterol, glucose, and uric acid compared with the HC. Conclusions: Chronic periodontitis negatively affected the overall well-being and systemic condition of a group of Brazilian individuals. Context: Interleukin-11 (IL-11) is a multifunctional cytokine with a probable regulatory role in the inflamed periodontal tissue. It has also been shown to inhibit the production of potent proinflammatory cytokines like tumor necrosis factor-alpha, IL-6 and IL-1β in vitro. Type 2 diabetes mellitus, which demonstrates an increase in proinflammatory cytokines, might hypothetically, display a decrease in the levels of IL-11, which down-regulates synthesis of the proinflammatory cytokines. Aims: This clinicobiochemical cross-sectional study was undertaken to try to interpret the link between IL-11, diabetes and periodontitis and to explore the probable protective role of IL-11. Materials and Methods: A total of 90 patients were included in the study and were divided into five groups based on community periodontal index scores and diabetes status. Probing pocket depth and clinical attachment level were measured in all the subjects. Gingival crevicular fluid (GCF) was collected from all the participants using micropipettes and blood samples were collected from subjects in Groups III, IV and V, for analysis of glycated hemoglobin. IL-11 levels were measured in GCF samples by enzyme-linked immunosorbent assay. Statistical Analysis: The data obtained were subjected to statistical analysis. Results: The GCF IL-11 levels decreased from periodontal health to disease and in periodontitis patients with type 2 diabetes with decreasing glycemic control. Conclusions: Interleukin-11 may play an important role in the modulation of immune response via the reduction of proinflammatory cytokine production and periodontal tissue damage. It was seen in this study that IL-11 could be detected in GCF and the levels of IL-11 in GCF decreased progressively from healthy to periodontitis sites. IL-11 levels were significantly lower in chronic periodontitis group when compared to gingivitis group. The decrease in the levels of IL-11 probably indicates that both diabetes and periodontitis may play a synergistic role in the suppression of protective host responses. The potential of IL-11 as a probable biomarker of inflammation in both periodontal disease and diabetes mellitus is indicated by the changeability of IL-11 levels with the change in periodontal disease status and glycemic control. Further longitudinal studies are needed to validate IL-11 as a "biomarker of inflammation" in periodontal disease and diabetes progression and to prove its role in the connecting link between periodontal disease and type 2 diabetes mellitus. Background: The relationship between diabetes and periodontitis has been studied for more than 50 years and is generally agreed that the periodontal disease is more prevalent in diabetic patients compared to nondiabetics. Vascular changes like increased thickness of basement membrane in small vessels has been reported in diabetic patients, but the quantity of blood vessels in gingiva of diabetic patients has not been discussed much. The aim of this study was to compare the number of blood vessels in gingiva between chronic periodontitis (CP) patients, CP with diabetes (type 2), and normal healthy gingiva. Materials and Methods: The study included 75 patients, divided into three groups of 25 patients each-Group I with healthy periodontium (HP), Group II with CP, and Group III with CP with diabetes mellitus (CPDM).Gingival biopsies were obtained from the subjects undergoing crown lengthening procedure for Group I, and in patients with CP and in CPDM biopsies were collected from teeth undergoing extraction. 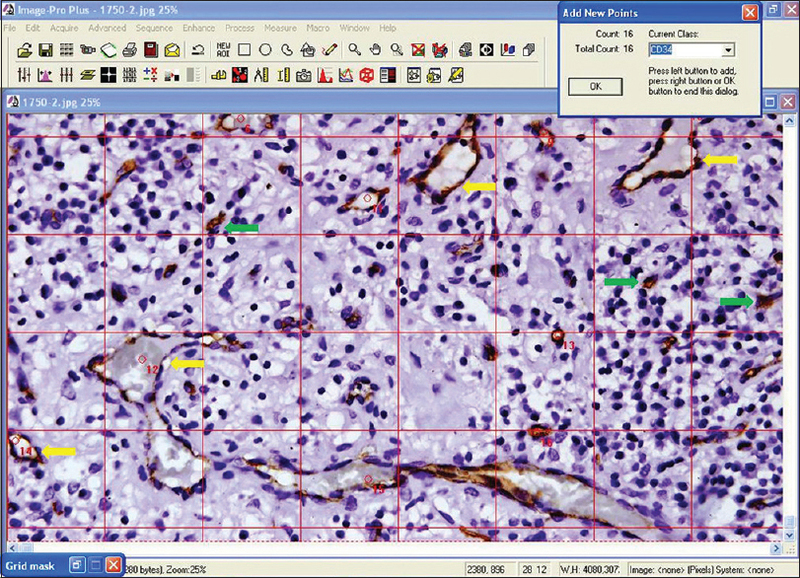 Sections were prepared for immune histochemical staining with CD34. Results: Difference was observed in the average number of blood vessels when compared between HP, CP, and CPDM groups. Statistical significant difference was observed when the HP and CP groups and HP and CPDM groups were compared. Conclusion: The results of the study indicated that the number of blood vessels in gingival connective tissue is significantly higher in CP and CPDM patients. Background: Myeloperoxidase (MPO) is a lysosomal enzyme found in the azurophilic granules of polymorphonuclear leukocytes and is able to mediate inflammatory tissue destruction in aggressive and chronic periodontitis (CP). Human telomerase is a multi subunit ribonucleoprotein enzyme concerned with telomeric lengthening and homeostasis in man and has been found to be elevated in inflammatory conditions such as rheumatoid arthritis and periodontitis. The aim of this study was to explore in aggressive periodontitis (AP) subjects: (i) The role of MPO-463G/A gene polymorphism and (ii) the level of telomerase expression. These parameters have been compared with the subjects of CP and that of the healthy controls. Materials and Methods: A total of 45 subjects of the age group 20-50 years and free from any known systemic disease were included in the study. They were divided into three groups - Group I-periodontally healthy control (n = 15), Group II-CP (n = 15) and Group III-AP (n = 15). Peripheral blood samples and gingival tissue samples were collected for MPO gene polymorphism and telomerase expression, respectively, for detection by reverse transcriptase polymerase chain reaction. Results: The frequencies of AG and AA genotypes in the MPO gene polymorphism were more common in the AP subjects when compared to the controls. The m-RNA expression of human telomerase reverse transcriptase (hTERT) was undetectable in the gingival tissue of the control group. Its expression in AP subjects was significantly higher than that of CP group (83.61 ± 2.94 in CP and 104.27 ± 6.06 in AP) (P < 0.0001). Conclusions: Our data suggest that MPO-463G/A may be associated with increased risk of AP. The level of tissue hTERT was elevated in AP subjects as compared to CP and healthy control groups. Background: The potential drawbacks of the existing antiplaque agents call for innovative strategies that are safe, effective, and easily available. Objective: The objective was to assess and compare antimicrobial efficacy of four plant extracts derived using hot and cold extraction methods against Streptococcus mutans, Streptococcus sanguis, and Streptococcus salivarius. Materials and Methods: The leaves of Acacia nilotica, P. guajava, Eucalyptus hybrid, and Murraya konigii L. Sprengel were collected from the surrounding areas, identified and authenticated by a taxonomist. The leaves were washed, shade-dried, and hand crushed to obtain coarse powder. This was subsequently ground into a fine powder and extracted using ethanol by cold infusion and hot extraction process. The antimicrobial efficacy testing was done on American Type Culture Collection strains of S. mutans, S. sanguis, and S. salivarius using agar well diffusion method. 0.2% chlorhexidine and dimethyl sulfoxide were used as positive and negative controls. The mean inhibition zone using 10% concentration of these extracts was compared using independent sample t-test and one-way analysis of variance. Results: All the four plant extracts inhibited the growth of S. mutans, S. sanguis, and S. salivarius irrespective of the method of extraction. The extracts of A. nilotica, P. guajava, and E. hybrid derived from both the methods of extraction exhibited a significantly higher inhibition zone against S. mutans in comparison with Murraya koenigii L. Sprengel and chlorhexidine. The cold extracts of A. nilotica and E. hybrid exhibited higher zone of inhibition against S. sanguis while the hot extracts of M. koenigii L. Sprengel exhibited a higher zone of inhibition against S. mutans. Conclusion: All the four plant extracts derived using either hot or cold extraction were effective against these bacteria and have the potential to be used as antiplaque agents. Background: To compare the enamel protection efficacy of stannous-containing sodium fluoride and sodium monofluorophosphate (MFP)/triclosan dentifrices marketed in India in an in situ erosion model with acidic challenge. Materials and Methods: This randomised and controlled, in situ, supervised, double-blind clinical trial employed a two-treatment, four-period crossover design, wherein subjects wore an appliance fitted with human enamel samples 6 h/day during each 10 day treatment period and swished twice daily with their assigned dentifrice slurry: Oral-B ® Pro-Health (maximum 1,000 ppm F as sodium fluoride with stannous chloride) or Colgate ® Strong Teeth with Cavity Protection (maximum 1,000 F as sodium MFP and triclosan). Subjects swished with 250 ml of orange juice over a 10 min period after each treatment and twice daily for the acidic erosive challenge. Enamel samples were measured for tooth surface loss using contact profilometry at baseline and day 10. Results: A total of 34 subjects were randomised to treatment; 32 subjects completed the final visit. Baseline profilometry measurements of the specimen surfaces were near zero within ± 0.3 μm, and no statistically significant difference (P > 0.48) on average was observed between the two test dentifrices. At day 10, the stannous-containing dentifrice demonstrated 88% less erosion (P < 0.0001) relative to the MFP/triclosan dentifrice. Estimated medians (95% confidence intervals) were 0.21 μm (0.17, 0.25) for the stannous-containing dentifrice versus 1.66 μm (1.39, 1.99) for the MFP/triclosan dentifrice. Both dentifrices were well-tolerated. Conclusions: Compared with MFP/triclosan toothpaste, a stabilised stannous-containing sodium fluoride dentifrice gave statistically significantly greater protection against tooth enamel surface loss in situ following repeated acid erosive challenge. Aim: Chronic periodontal disease (CPD) and type 2 diabetes mellitus (T2DM) share common pathogenic pathways involving the cytokine network resulting in increased susceptibility to both diseases, leading to increased inflammatory destruction, insulin resistance, and poor glycemic control. Periodontal treatment may improve glycemic control. The aim of this study was to evaluate the effect of scaling and root planing (SRP) of T2DM patients with CPD on hyperglycemia and the levels of serum interleukin-10 (IL-10). Materials and Methods: Forty-five subjects were divided into three groups comprising 15 subjects each as Group 1 (healthy controls), Group 2 (CPD patients), and Group 3 (T2DM patients with CPD). 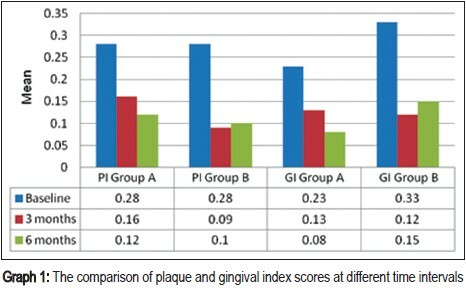 Plaque index, gingival index (GI), probing pocket depths (PPD), clinical attachment loss (AL), bleeding on probing (BoP), random blood sugar, glycosylated hemoglobin (HbA1C), and serum IL-10 were measured at baseline; SRP was performed on Groups 2 and 3 and the selected parameters recorded again at 6 months. Results: Statistically significant (P < 0.05) differences were observed in the variables at baseline and 6 months after SRP between the three groups using one-way ANOVA. The paired samples t-test for PPD and AL in Group 3 was statistically significant. Group 3 revealed positive correlations between PPD and HbA1C, BoP and IL-10, respectively, at 6 months and a predictable association of HbA1C with PPD and GI, and IL-10 levels with BoP, respectively, at 6 months. Conclusion: Scaling and root planing is effective in reducing blood glucose levels in T2DM patient with pocket depths and effective in elevating systemic IL-10 levels in CPD patients and CPD patients with T2DM. Background: The dimensions of dentogingival junction have been evaluated from autopsy jaw specimens. Previous studies demonstrated variability in histologic biologic width (BW) in periodontal health and mild periodontitis. 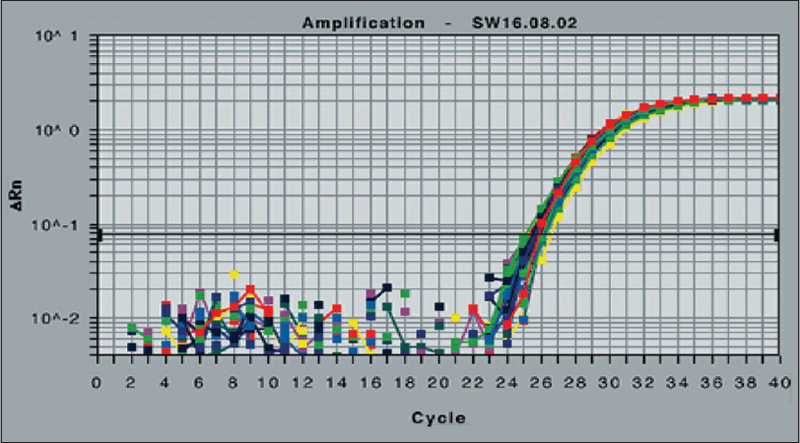 Few studies have been done on the measurement of clinical BW in periodontitis. BW variation provides implications for selection of surgical or nonsurgical approaches. The purpose of this study was to determine clinical BW in periodontal health and chronic generalized periodontitis and to compare it with histologic dimensions of BW. Materials and Methods: A total of 20 subjects with chronic generalized periodontitis and 20 subjects with healthy periodontium were included in the present study. Plaque index and community periodontal index of treatment needs were scored; moreover, probing depth (PD) and clinical attachment level were measured. 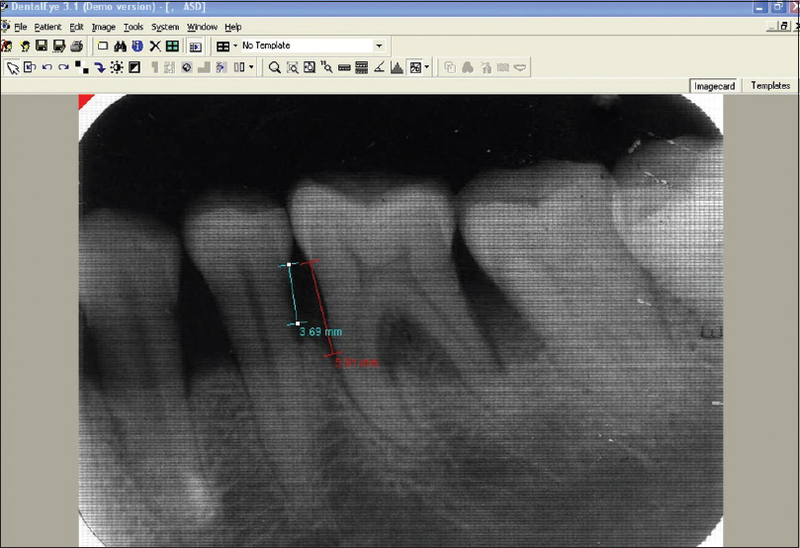 Full mouth intraoral periapical radiographs were taken, and digitalized images were obtained to measure the crestal bone level using computerized software. Results: Clinical BW was significantly greater in both healthy and periodontitis groups than previously reported histologic BW of 2.04 mm (P < 0.001). The mean clinical BW was 3.98 mm. Conclusion: Mean clinical BW in both groups was significantly greater than histologic BW and sites with shallow PDs demonstrated greatest BW, suggesting that these sites may be at increased risk for losing significant attachment during surgical procedures. Background: The width of attached gingiva varies from tooth to tooth and also among individuals with mixed opinions regarding an "adequate" or "sufficient" dimension of the gingiva. Although the need for a so-called adequate amount of keratinized tissue for maintenance of periodontal health is questionable, the mucogingival junction serves as an important clinical landmark in periodontal evaluation. There are various methods of locating the mucogingival junction namely the functional method and the visual method with and without histochemical staining, which aid in the measurement of the width of attached gingiva. 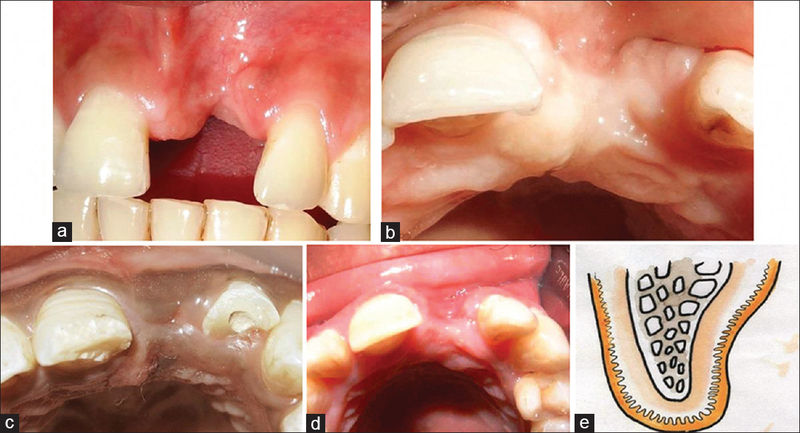 Materials and Methods: This study was carried out to assess the full mouth mid-buccal width of attached gingiva in individuals of four different age groups. This study also evaluated the difference in visual and histochemical methods in identification of the mucogingival junction to calculate the width of attached gingiva. Results: It was seen that the width of attached gingiva increases with age, and there was no significant difference in the width of attached gingiva by both the methods. Conclusion: Width of attached gingival varies in different areas of the mouth and also increases with age with no significant difference in the method of its assessment. Aims: The aim was to compare the recession coverage outcomes when done macrosurgically and microsurgically. Background: Increasing interest in esthetics and the related problems such as hypersensitivity and root caries have favored the development of many root coverage procedures. Recession coverage up to a certain extent has solved these problems, but these procedures need good maintenance after the surgery for long-term benefits. With increasing advances in the field of recession coverage, microscope has added another dimension in undertaking the surgical procedure. Materials and Methods: Thirty Miller's Class I and II recession were treated using the sub-epithelial connective tissue graft from the palate. In 15 sites, the graft was placed at the recipient site with unaided eye (Group A) and in other 15 sites the graft was placed using surgical microscope (Group B). Clinical evaluation was done at baseline, 12 weeks and 24 weeks postoperatively using plaque index, gingival index, vertical recession (VR), probing depth, clinical attachment level (CAL), width of attached gingiva, papilla height (PH) and width, malalignment index (MI) and esthetic appearance. Statistical Analysis Used: Paired and unpaired Student's t-test along with Wilcoxon Z-test were used to analyze the results and probability of P < 0.05 were accepted to reject the null hypothesis. Pearson correlation was used to correlate two parameters such as VR and CAL and MI and VR. Results: Both the techniques demonstrated predictable mean root coverage (Group A 61.78% and Group B 67.58%) at 6 months postsurgery. CAL gain was slightly better in Group B patients when compared to Group A patients. A moderate positive correlation for Group A while a mild correlation in Group B was seen between the MI and VR. Conclusion: The use of the microscope enhances the results, but obtaining an expertise in using needs a lot of practice. The periodontal healing by both techniques should be evaluated histologically. Title of the Study: Validation of Hindi Version of Oral health Impact Profile (OHIP-14) Aim: To validate the Hindi version of OHIP-14. Settings and Design: The study was carried out in K.M. Shah Dental College & Hospital, Vadodara. Materials and Methods: OHIP-14 was translated into Hindi language.102 participants were given English as well as Hindi versions of OHIP-14. Statistical Analysis Used: Individual question were analyzed using Pearson Chi-Square test, Likelihood Ratio test and Linear-by-Linear Association test. The entire questionnaire in English and Hindi language were comparatively analyzed using Unpaired T test & Pearson correlation coefficient test. Results: All the 14 questions showed no statistically significant difference between the English OHIP-14 and the translated Hindi version of OHIP-14. Results of Unpaired T test (P = 0.61) were statistically insignificant. Pearson Correlation coefficient test was 0.963 suggesting that the translated Hindi version was highly correlated to the original English version. Conclusion: The translated Hindi version of OHIP-14 is hence established as a valid tool for conduction of oral health related & quality of life surveys in Hindi language which is the most commonly used language in the Indian subcontinent. Background: The periodontal diseases are the most prevalent oral diseases worldwide especially in developing countries like India. The objective of this cross-sectional survey was to determine the prevalence of periodontal diseases and treatment needs (TNs) in a hospital-based population. 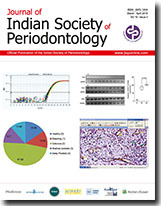 Materials and Methods: Totally, 500 men and women (15-74 years) were recruited and periodontal status of each study subject and sextant was evaluated on the basis of community periodontal index of TNs, and thereafter TN for each subject and sextant was categorized on the basis of the highest code recorded during the examination. 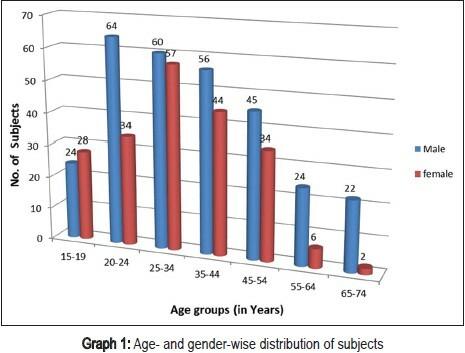 Results: A total of 500 subjects (59% males and 41% females) was divided into seven age groups, that is, 15-19, 20-24, 25-34, 35-44, 45-54, 55-64, and 65-74 years and sextants were included from the 486 subjects. Healthy periodontium, bleeding on probing, calculus, shallow pockets, and deep pockets were found in 3.9%, 6.58%, 50.61%, 20.98%, and 17.90% subjects, respectively. Males were more affected with shallow and deep pockets as compared to females. Periodontal diseases in the early stages were more prevalent in the younger age groups, whereas advanced stages were more prevalent in older age groups. 17.90% subjects and 11.48% sextants need complex treatment. About 77.98% subjects and 73.15% sextants require either oral hygiene instructions or oral hygiene instructions and oral prophylaxis. Only 3.9% subjects and 15.36% sextants were healthy and needed no treatment. Conclusions: Periodontal diseases were found to be 96.30% in the study population and the results indicate that majority of the population need primary and secondary level of preventive program to reduce the chances of initiation or progression of periodontal diseases thereby improving their systemic health overall. Context: Adequate amount of keratinized gingiva is necessary to keep gingiva healthy and free of infl ammation. Autografts have been used for years with great success to increase the width of attached gingiva. Autografts, however, have the disadvantage of increasing postoperative morbidity and improper color match with the adjacent tissues. Alloderm ® allograft has been introduced as an alternative to autografts to overcome these disadvantages. Aim: In this study, the efficacy of alloderm ® in increasing the width of attached gingiva and the stability of gained attached gingiva was evaluated clinically. 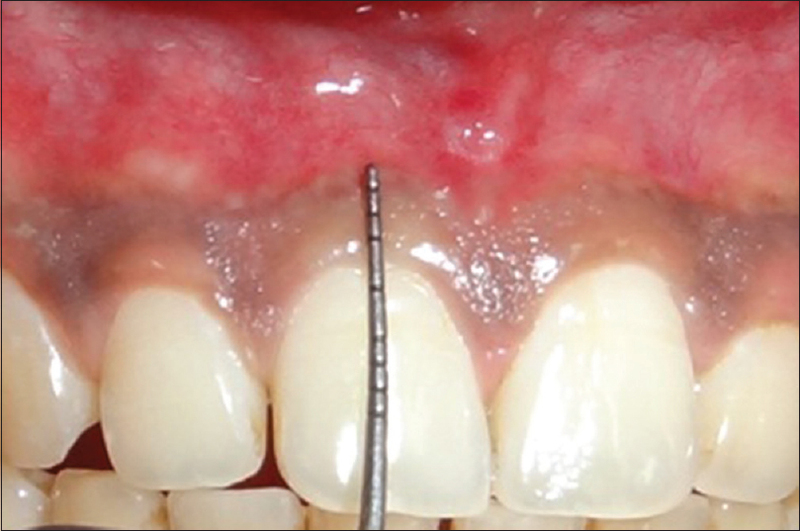 Materials and Methods: Five patients with sites showing inadequate width of attached gingiva (≤1 mm) were enrolled for the study. The width of keratinized gingiva and other clinical parameters were recorded at baseline and 9th month postoperatively. Result: In all cases, there is the average increase of about 2.5 mm of attached gingiva and was maintained for 9-month. Percentage shrinkage of the graft is about 75% at the end of 3 rd month in all cases. Excellent colors match with adjacent tissue has been obtained. Conclusion: The study signifi es that Alloderm ® results in an adequate increase in the amount of attached gingiva and therefore can be used successfully in place of autografts. The aim of the article is to present a report on the clinical presentation of plasma cell gingivitis with the use of herbal toothpowder. Plasma cell gingivitis [PCG] is a rare benign condition of the gingiva characterized by sharply demarcated erythematous and edematous gingivitis often extending to the mucogingival junction. As the name suggests it is diffuse and massive infiltration of plasma cells into the sub-epithelial gingival tissue. It is a hypersensitivity reaction to some antigen, often flavouring agents or spices found in chewing gums, toothpastes and lorenzes. 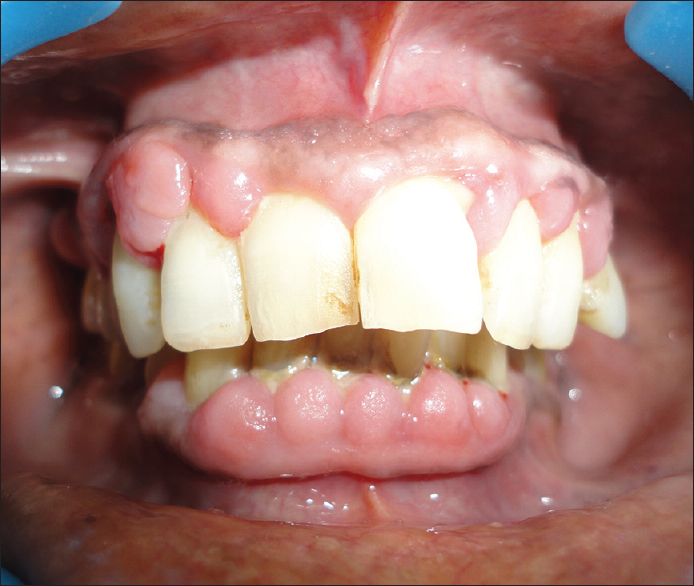 A 27-yr old male with a chief complaint of painful, bleeding swollen mass in his lower front teeth region with prolong use of herbal toothpowder.The gingiva bled readily on probing. Patient was advised to refrain from the use of herbal toothpowder and along with periodontal treatment, no further reoccurrence was found. as more and more herbal products are gaining popularity, clinicians should be aware of effects of these products. 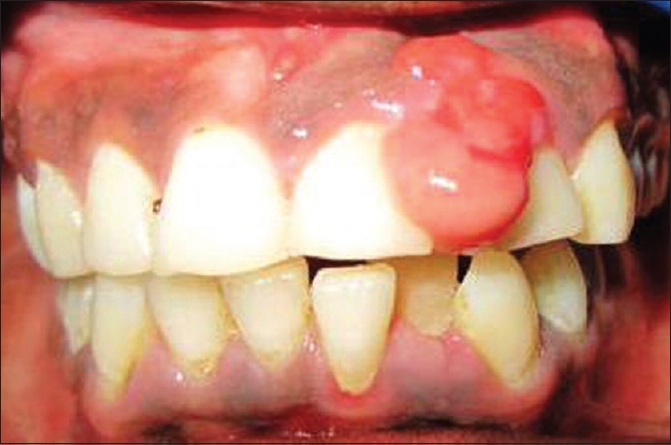 Early diagnosis is essential as plasma cell gingivitis has similar pathologic changes seen clinically as in leukemia, HIV infection, discoid lupus erythematosis, atrophic lichen planus, desquamative gingivitis, or cicatrical pemphigoid which must be differentiated through hematologic and serologic testing. 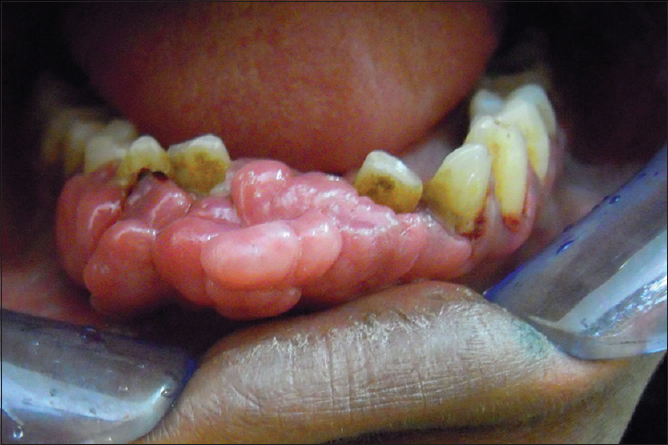 Peripheral ossifying fibroma (POF) is a reactive gingival growth, which accounts for 9.6% of gingival lesions. It exhibits a peak incidence between the second and third decades of life with a female predilection. Treatment includes surgical excision down to the periosteum and periodontal ligament with thorough root planning. Another option available in place of conventional surgical excision is the excision using lasers. Here is a case of POF affecting anterior maxillary gingiva in 19-year-old male patient successfully managed using an 810-nm diode laser. Replacement of missing maxillary anterior tooth with localized residual alveolar ridge defect is challenging, considering the high esthetic demand. Various soft and hard tissue procedures were proposed to correct alveolar ridge deformities. Novel techniques have evolved in treating these ridge defects to improve function and esthetics. 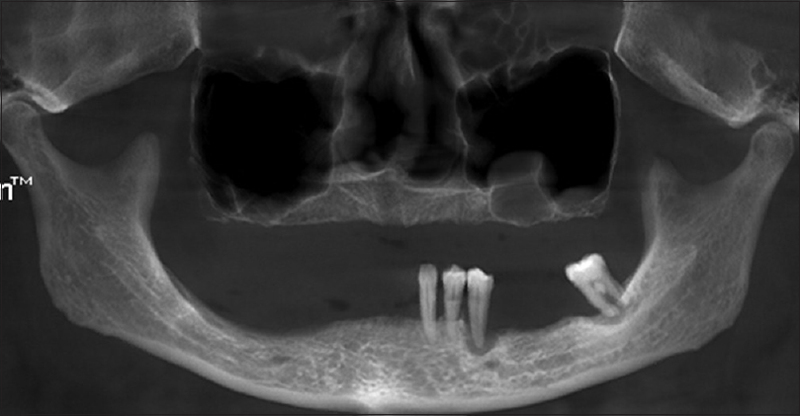 In the present case reports, a novel technique using long palatal connective tissue rolled pedicle graft with demineralized freeze-dried bone allografts (DFDBAs) plus Platelet-rich fibrin (PRF) combination was proposed to correct the Class III localized anterior maxillary anterior alveolar ridge defect. The present technique resulted in predictable ridge augmentation, which can be attributed to the soft and hard tissue augmentation with a connective tissue pedicle and DFDBA plus PRF combination. This technique suggests a variation in roll technique with DFDBA plus PRF and appears to promise in gaining predictable volume in the residual ridge defect and can be considered for the treatment of moderate to severe maxillary anterior ridge defects. 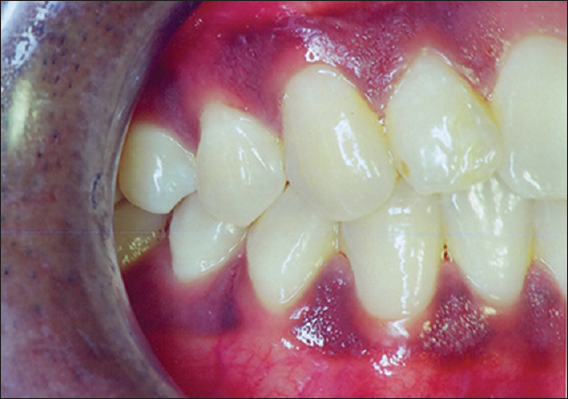 Gingival recession is a common manifestation in most populations. Gingival recession is clinically manifested by an apical displacement of the gingival tissues, leading to root surface exposure. Gingival recession may be a concern for patients for a number of reasons such as root hypersensitivity, erosion, root caries, and esthetics (Wennstrom 1996). Recently, new techniques have been suggested for the surgical treatment of multiple adjacent recession type defects. These are mainly derived from the coronally advanced flap, a supraperiosteal envelope technique in combination with a subepithelial connective tissue graft, or its evolution as a tunnel technique. The current case reports introduce a novel, minimally invasive approach applicable for both isolated recession defects as well as multiple contiguous defects in the maxillary anterior region. Access to the surgical site is obtained by means of an approach referred to as vestibular incision subperiosteal tunnel access. Maxillary jaw is restricted superiorly with maxillary sinus in the posterior region and nasal cavity in the anterior region. Augmentation of distal maxilla with recessed maxillary sinus has been documented since, last few decades. Sinus lifts the procedure either through crestal or lateral approach proves to be an effective way for augmenting bone for the placement of dental implants in atrophied posterior maxilla. However, when it comes to vertically deficient anterior maxilla, lifting of the nasal membrane is not considered. Perhaps, recent studies have shown greater success of dental implant placed after augmentation of the nasal floor. This report emphasizes on an observation of significant bone formation after indirect lifting of the nasal membrane with smooth polished surface bi-cortical implants. Gingival enlargement comprises any clinical condition in which an increase in the size of the gingiva is observed. It is a side effect associated with some distinct classes of drugs, such as anticonvulsants, immunosuppressant, and calcium channel blockers. Among calcium channel blockers, nifedipine causes gingival enlargement in about 10% of patients, whereas the incidence of amlodipine, a third-generation calcium channel blocker, induced gingival enlargement is very limited. Because the calcium antagonists, albeit to a variable degree, act as inhibitors of P-glycoprotein (P-gp), the gene product of multidrug resistance 1 (MDR1), and inflammation may modify P-gp expression. We hereby, report a case of amlodipine-induced gingival enlargement with MDR1 3435C/T polymorphism, associated with inflammatory changes due to plaque accumulation, in a 50-year-old hypertensive male patient. 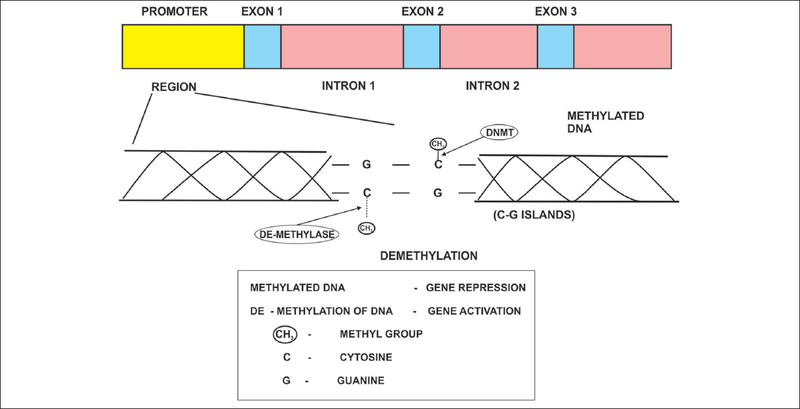 The genotype obtained for the polymorphism was a heteromutant genotype, thus supporting the contention that the MDR1 polymorphism may alter the inflammatory response to the drug.